What the What? Reviews offer a quick overview of various smaller, OOP, or Obscure RPGs. A core system for playing historical or semi-historical campaigns in the black-powder period. This depends on the campaign frame- however the rules lend themselves to classic piracy games (Pirates and Plunder; Privateers and Pirates), musketeer (Flashing Blades; All for One: Régime Diabolique), or strange magic in the Early Modern era (Mage: The Sorcerers Crusade; The Savage World of Solomon Kane; On Her Majesty's Arcane Service). GM’s can determine the focus and what level of strangeness and/or magic appears. Renaissance includes rules for Alchemy and Witchcraft. However generally characters will be relatively normal people in this world- mostly lacking strange powers, unique advantages, and superlative abilities which make them more four-color than real. Renaissance games will usually be lower powered and realistic. Considered them talented normals who have an edge through training and skills. Characters will have come out of a profession which defines them, such as Serf, Camp Follower, Highwayman, Scholar, Valet and so on. As well players will belong to a faction- guild, religious group, brotherhood, nation, gang or the like. This helps define the character, but also has some significant mechanical obligations. 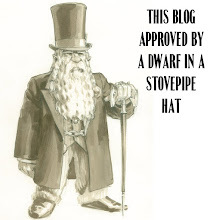 This concept means that while PCs might be adventurers, they also have ties and bonds which connect them to communities. These groups offer support but may also have particular strictures and restrictions. Belonging to a faction may generate animosity with others, including among the party. Renaissance is another version of the Basic Role-Playing System, here referred to as D100 Rules. Other versions of that can be found in Call of Cthulhu, Legend, Age of Shadow, and a host of OOP games (Runequest, Stormbringer, Ringworld, etc). Characters have a set of seven characteristics generated through 3d6 or 2d6+6 rolls. A small set of figured characteristics come from these. The main defining abilities features of characters come from skills which are rated as percentages. Characters have access to 21 common skills, and then can also gain others based on professions. Generally players attempt to roll under a skill’s number in order to success with a test. Players pick a social class which defines skill bonuses, advanced skills, starting cash, and the profession picks available to them. Professions add bonuses to the common skills and add additional advanced skills. Basic skills include Gun Combat, Persistence, Perception, Swim and so on and usually have a default rating based on characteristics. Advanced skills are usually narrower or require special training: Artillery, Commerce, Mechanisms for example. Task resolution is simple, rolling a percentile die below the appropriate skill value. Difficulties and modifiers are applies to the skill value before the roll. 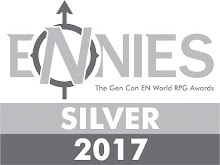 Critical successes occur when the player rolls below 10% of their skill value and fumbles occur only on a “00.” Contested skill checks go to the successful party who rolled highest. Combat occurs in rounds lasting five second. Characters have a Combat action, a Reaction (usually a defense), and a Movement Action per round. Action choices can restrict or impact your other actions. Attacks can be negated or reduce by defensive actions- Dodge or Parry. Characters have relatively few hit points, so the rolled damage from an attack can take them out pretty easily. Characters who take more damage from a blow than their Major Wound level suffer ongoing effects of a Serious Wound (or Grave Wound if they go below 0 HP). This effect is randomized with a d10 on table determining location. The system is pretty easy to pick up if you’ve played any form of BRP. It adds a few new bells and sub-systems. It has some crunch to it but doesn’t present an overwhelming set of choices. 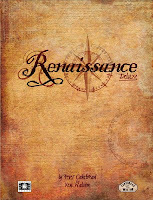 Renaissance includes an optional set of rules for quick combat. The system as a whole includes a significant amount of detail. How much of this a GM will use depends on their campaign. If you want to track the illumination distance of various light sources, record fatigue, consider encumbrance, and check for illness the system has rules. That’s necessary and right for a game trying to emulate this era- but GMs will want to figure out exactly to balance playability, detail, and grittiness. WHAT’S COOL AND UNCOOL ABOUT IT? The game has detail, but feels familiar. It adds to the D100/BRP mechanics without overelaborating it. The changes fit with the genre and focus. Many D100 versions have players check on skills they used successfully after a session to see if they increase. Renaissance offers improvement points which players can spend to check on a skill, gaining a 1d4+1 if they roll higher than their skill and 1 point if they roll equal or below. These points can also be used to learn new skills or increase characteristics. Generic systems often run one of two directions- overly complicated in an attempt to model everything or overly general in an attempt to simply contain everything. Renaissance falls nicely in the middle. The period detail, mechanical and otherwise is excellent and integrated well. I especially like the horrific section on diseases and physical ailments. There’s excellent detail on everyday life and smart mechanics for the two magics. Both systems are involved, but feel like they’d be worth playing out and exploring. Alchemy and Witchcraft seem distinct and different in the rules. There are sanity rules and systems for mental healing, with the idea that community support can offer mental armor. My favorite bit from the game is the concept of Factions and Righteousness. As I mentioned above, characters belong to factions. The GM can use these to model groups and help establish a character backstory with ongoing implications. Communities and group membership were historically hugely important- defining self-identity and how others saw you. A historical game has to include that. So the Scotsman might belong to a clan, the merchant might belong to a guild, the sheriff might belong to a religious order. Each has certain important values and ideals, as well as an expected “Zeal” which is a rating. Renaissance goes one step further with players’ faith being tested and the possibility of debates between party members or with NPCs. At the same time, mechanizing these aspects feels a little “gamey.” Tracking these points, adding losses based on a legislated morality, and offering the ability for a player to use these as a weapon against a fellow PC may not suit everyone’s tastes. It reminds me of the problem I have with some video game morality systems, which create a fairly black and white code- effectively a numerical rating of good vs. evil. I’m more in favor of systems like that in BioWare’s Dragon Age, where your actions don’t shift on an objective set scale but instead affect how others view you. The system also has some odd mechanical design choices- percentiles for skill use, d20 for fumble tables, d10 for wound tables. Those could be more standardized. The section on ships and naval combat feels all too brief, given the period. I would like to have seen more here, given the prominence of Pirate campaigns set in the period. WHAT’S THE CORE BOOK AND WHAT ELSE IS THERE? 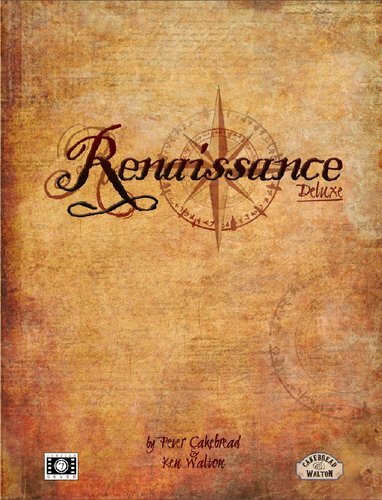 The core-book Renaissance Deluxe comes in at 171 pages, available as a pdf or in a print version. The book looks good with a simple two-column layout. The pages have a grey-scale watermark; that makes printing a reference copy from the pdf something of a pain in terms of ink. It looks good on screen however. Unlike other games, that layout choice doesn’t affect readability. The interior artwork is simple and generic- appropriate to the period. But the buzzword for the product as a whole is practicality. You could easily run a game with just the rules presented in this book. A bare-bones version of the system can be downloaded for free, the Renaissance SRD. That’s 139 pages, so it is a complete version of the game rules. Currently Cakebread & Walton have three key secondary products for Renaissance. Clockwork & Chivalry 2e, is a stand-alone product which uses the Renaissance engine. This presents a magical post-apocalyptic take on the English Civil War. For my assessment of the first edition, see here. There are four adventures available for this setting, with two more forthcoming. Clockwork & Cthulhu offers a variation on the same ECW setting, but with Lovecraftian horror. That requires the Renaissance rules to play. Dark Streets is another setting sourcebook requiring the Renaissance rules. That covers a mid-18th Century London with officers in the desperately underprepared police force trying to stamp out forces of the Cthulhu Mythos. Finally, Cakebread & Walton have announced another setting sourcebook, Realms of Gold, which uses Renaissance to present a more high fantasy world with black powder elements. Historically minded gamers, especially those who enjoy the Early Modern Period. Fans of Basic Role-Playing seeking ideas for how to modify and rework the system to their taste. Toolbox GMs looking to see how other games deal with niche concepts like communities; ships; alchemy; and witchcraft. Gamers looking for a reasonably crunchy low-powered fantasy game. Those that enjoyed the careerist approach of old WHFRP and wanted something of that grit in a historical game. This is a solid rules set. I look forward to reading through the campaign supplements Cakebread & Walton have put together. Anyone even moderately interested should at the very least pick up the SRD version of it. I'm currently running Clockwork and Chivalry for my group. We are playing through the Kingdom and Commonwealth campaign, which is one of the best-written campaigns I've come across in 30 years. The Renaissance system is solid and we've yet to encounter a situation that it can't handle. We've also found that it drops into the background when role-playing becomes the primary focus of a scene or session. The rules for factions have only really come into play when determining how fanatical a particular NPC is regarding their chosen cause. PCs tend to begin with less than 50 Righteousness Points which I believe provides the players with free rein to narrate their characters' actions when beliefs are challenged. Overall we are throughly enjoying both the system and the setting. I'm glad to hear that- since C&C's a pretty amazing setting. re: the Faction rules: does that mean the mechanics are sidelined, or just invoked less often in your game? They are certainly not sidelined, rather they are not actively employed very often by the PCs. I use the Righteousness values of NPCs as a way of drawing a mental picture of an individual and thinking about how they might react to the PCs, or how the PCs may antagonise or butter-up a given NPC. I've been adapting elements of Renaissance to my Flashing Blades campaign for awhile now. It's a very good resource. I was wondering about that, since I consider you the expert on gaming in the period. Skip this and buy Flashing Blades instead. Still $12 from FGU's web site. Much better game. Suited to the time and genre.